But it isn't the history we thought we knew. For the surprising truth is that Laura’s stories were publishable only with Rose’s expert rewriting. Based on Rose’s unpublished diaries and Laura’s letters, A Wilder Rose tells the true story of the decade-long, intensive, and often troubled collaboration that produced the Little House books—the collaboration that Rose and Laura deliberately hid from their agent, editors, reviewers, and readers. When I first heard that Laura Ingalls Wilder may not have actually written the Little House series I had what I call a "toddler moment". I stuck my fingers in my ears and absolutely refused to believe it. Say it ain't so! I am thankful that I gave this book a shot. It explained a difficult situation and soothed my ruffled feathers. It made sense. 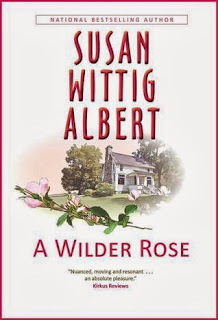 A Wilder Rose is a perfect blend of fact and fiction. It's clear, energetic, and a must for any fan of the Little House books. Gah! I should've accepted this one for review. It's hard to pick and choose between the offers! I haven't read the Little House books, I admit, but I was a big fan of the tv show growing up--I know, not the same thing, but I think I might have had the same initial reaction you did upon hearing the premise of this book. LOL Just from reading the description of the book though, I can see how it would make sense. This sounds like an interesting book. You should read them now, seriously! :D I read them while growing up and I read them to my oldest daughter when she was a young lady. Ahh, such great memories. I won this from Kirkus Book Reviews. We'll see if I agree with you. Wow. I had no idea about that! Fascinating. I loved those books as a kid! I heard about the possibility years ago and I wanted to pull my hair out, lol. This book explained it all very well. This sounds interesting. So the mother and daughter wrote the books right? Laura and Rose. I really loved the show as well! I used to watch it with my dad ;) I'm dating myself as well, lol! I've never been a huge Little House fan, but stuff like this is still totally intriguing to me and I know I would love this! Interesting! I enjoyed the Little House books, at least the few I know I read. Holy crap! This sounds fascinating! I have a friend who dressed up as Laura Ingalls Wilder every Halloween for years. I'm not sure I should tell her about this one... Perhaps she'd have a toddler moment too? I had a pioneer girl costume one year. My mom sewed it for me. My dad built a covered wagon our of our little red wagon, lengths of garden hose and a white sheet. Damn, that was awesome. I'm officially intrigued. I will be interested to find out the story behind that very successful collaboration! It's a very interesting story! That's a fascinating story! Definitely not something I knew. I need to read this. Better than a "senior moment" right? :) Ha! I WILL be reading this! The description you gave gave me a toddler fit of my own. No one dare talk smack about Laura Ingalls Wilder to me! She was my hero from the minute I owned her set of books until at least sixth grade. I pretty much just reread her books for years! No other books except the ones I teach can claim that on me...I don't reread books. Ok, tantrum over. I will read this book because I also like to know the truth and because I trust you when you say it all pans out in the end. How can I be a book brainiac if I don't even know the basics behind the one author I was a hipster fangirl for back in the 80s? I know just how you feel! I really do. Once you read this book it all makes a lot more sense, and it's not as bad as I imagined it to be :D Whew!! I hope you'll be able to get to it soon! Very interested in this. I only read the first book in the series, but they're so famous it's hard not to know quite a bit regardless. It's interesting it took so long to be uncovered. Ooh, I was offered this book too, but I turned it down. I think I was turned off by it being a novel; it seems like an interesting topic, but I would prefer a non-fiction account of this story. The nonfiction account is: Ghost In The Little House. I forgot the author's name. I'll be honest too..the cover isn't my favorite ;) LOL, good book though! !